People who observed their own brain activity using real-time fMRI feedback were better able to control and reduce their anxiety, a new study says. In a quirky new experiment, researchers at Yale University found that simply showing people what their anxious brains look like was enough to help those subjects lessen their anxiety. The participants in the study even learned how to control activity in a certain brain region after just two sessions of watching real-time brain imaging feedback. The scientists first recruited 23 people who reported having anxiety about germs and contamination. Then, they had the subjects come into the lab for four visits. During the first session, all of the subjects underwent functional magnetic resonance imaging (fMRI) while they looked at neutral images and images designed to trigger worries about germs. The researchers looked at a specific area of the brain called the orbitofrontal cortex, a region that has previously been linked to contamination anxiety. During the second and third visits, the participants first looked at contamination-related pictures and were told to try to minimize their worries. They ranked their anxiety on a scale from 1 to 5 for each image. Then, 12 of the subjects spent 90 minutes hooked up to an fMRI machine, during which time they viewed germ-y images alongside a real-time line-graph of activity in their orbitofrontal cortex. At the final visit, the subjects again looked at triggering pictures and ranked how anxious they felt. 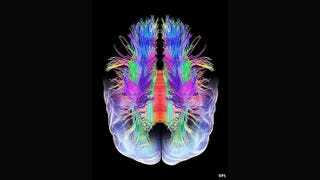 They also underwent another brain scan that looked for changes in connectivity in brain regions associated with emotion regulation and cognitive control. What's more, the final brain scans showed that the people who saw their own real-time brain activity had more connectivity in brain regions associated with emotion regulation and cognitive control. By contrast, the control group didn't show any significant brain changes. This is the first time scientists have explored real-time brain feedback as a treatment for anxiety, according to the researchers. The findings suggest the technique could be used as a new and effective treatment for obsessive-compulsive disorder. The study appeared April 30 in the journal Translational Psychiatry.